The Red River Bridge War. 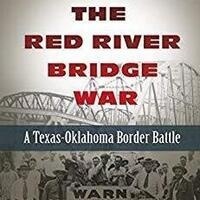 At the beginning of America’s Great Depression, Texas and Oklahoma armed up and went to war over a 75-cent toll bridge that connected their states across the Red River. It was a two-week affair marked by the presence of National Guardsmen with field artillery, Texas Rangers with itchy trigger fingers, angry mobs, Model T blockade runners, and even a costumed Native American peace delegation. Nonfiction.